Is Your Swimming Pool Ready for the End of the Season ? - Leisure Time Warehouse | Hot Tubs, Swim Spas, and Pools. Ohio's Best Dealer! With the fall season underway, now is the time to think about closing the pool for the end of the season. There are a few things to consider when closing for the winter season. If your pool cover is looking a bit old, this might be a good time to consider a new replacement pool cover. Whether your pool is an above-ground pool or an in-ground pool, the cover should fit snug, have no visible tears, and securely cover the pool. With pools, safety is always a major concern. Even when the pool is closed for the season, ensure the cover securely fits the pool so nothing can enter it. The end of season pool closing usually means winterizing the pool. If you have lost your closing instructions or if you do not know the proper steps, LeisureTime Warehouse can help you learn about pool maintenance. There are a few steps and tips to think about as you complete your end of season closing routine. Make it a team effort and train another adult family member to help you with this annual task and write down a list of the steps for others to follow. Below are some helpful tips for closing the pool for the season. Gather your necessary tools, the winterizing chemical kit, and clean the pool a final time before closing it for the season. Assess the pool cover and pool components. Use test strips or a water testing kit to test the condition of the water. The optimum pH level is 7.4 and 7.6. The alkaline level is best at 100 and 150 parts per million (ppm). Add the correct amount of winterizing chemicals to the water to protect it during the winter months. Properly balanced water will cause less damage to the pool liner and other components. 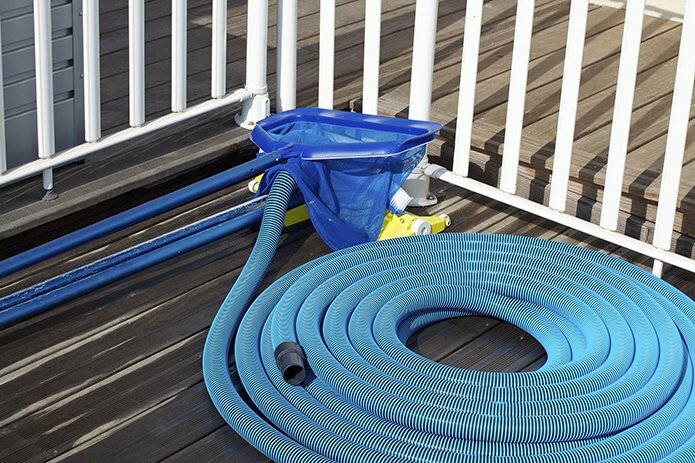 Check the winterizing kit directions to determine if the pool filter will need to be run. Add pool shock to properly sanitize for the winter. If you use a fast-dissolving shock or a regular calcium hypochlorite shock, allow ample time for the chemicals to work before covering the pool. In addition, add algaecide and a clarifying enzyme treatment to prevent algae build-up over the winter months. Also, remove the water from the pool lines, or use swimming pool antifreeze, and then plug the lines. To avoid cracking the skimmer, remove it and store it in a dry place out of the cold weather or cover it using a winter skimmer cover. Some people drain the pool below the skimmer line. It is important to follow the directions that came with the pool, properly winterize the filter and the pump. Another tip remember to properly clean and store away all swimming pool toys and accessories to be prepared for the start of a new swim season when the time comes! LeisureTime Warehouse is your choice for affordable swimming pools in the greater Cleveland area. Whether you want an above ground or in-ground swimming pool, we’re able to meet your needs. We have a wide selection of brands, designs and styles to choose from. As well as all the necessities you will need for your pool. Our experienced swimming pool installation technicians can help you today! Call us at (440) 623-7554 to learn more.